Day 0 to 3 weeks. 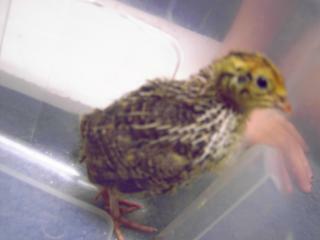 My girls aged 8 and 3 have been bugging me to raise quail for a year. I finally gave in. We purhased a Hova-Bator with egg turner from a store on-line. We then won an ebay auction for 45 eggs from a farm in Florida. It was late in the year but we hoped to hatch a few. The hatch was not great but since it was our first time incubating anything we were happy with our hatch. We ended up with 17 chicks hatching. It was kind of sad but 2 or 3 of the other eggs we could hear them chirping but they never popped out. On day number 3 one of our 17 chicks died. The 16 remaining have been doing great. 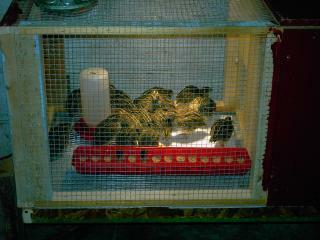 They are hopping and trying to fly at 3 weeks old. I had them in my heated basement but due to the mess I built a bigger pen and moved them to the garage. The pic below is of the new pen. The pen is 3 X 2 X 18" high. The pen currently has all 16 of my chicks in it but I hope to only keep 8 birds over the winter.